Seleucid Coins, Part I, is the first comprehensive treatment of early Seleucid coinage since Edward T. Newell’s Eastern Seleucid Mints (1938) and Western Seleucid Mints (1941). It expands on Newell’s catalogues with hundreds of new varieties that have come to light over the past sixty years, bringing together issues described in the scholarly literature and in commercial publications, as well as much material that is published here for the first time. In addition, Houghton and Lorber have critically examined both Newell’s attributions and those of other scholars. They propose a number of significant reattributions, some of which redraw the map of Seleucid numismatics. 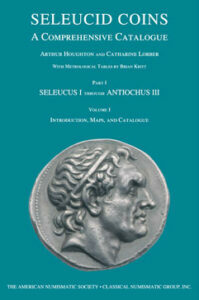 Seleucid Coins is intended to be, first and foremost, a practical resource for coin identification. It is designed to be accessible to beginners and to numismatists who do not specialize in the Seleucids. The catalogues are organized in historical and geographic order, first by reign, then by mint, then by metal, denomination and issue. There are indices that enable searches by control marks, remarkable types, remarkable legends, and countermarks. More than one hundred plates illustrate representative examples of virtually every coin type and denomination from every mint. In addition to an easy entry to the identification of Seleucid coins, the book contains extensive historical and other reference material that allows a deeper understanding of the historical context of Seleucid coin production. There is an introductory essay for each reign, opening with a summary of historical events, and proceeding with an overview of the ruler’s coinage, mint policies, and iconographic program. Yet broader overviews are available in the front matter: a chronological table that juxtaposes major historical and numismatic developments, a stemma of Seleucid genealogy, and general observations on mint function and administration. A succession of maps illustrates the changing constellations of Seleucid mints. The appendices offer in-depth treatment of special topics, including bronze denominations and metrology, and countermarks appearing on Seleucid bronze coins. Other appendices are resources for further study: a complete list of hoards containing early Seleucid coins, and detailed surveys of the monetary output of the early Seleucid kings by reign and by region. Seleucid Coins, Part 1, will become an indispensable reference work for collectors, dealers, and scholars, including those in the fields of archaeology, history and art history. Two volumes, illustrated. Seleucid Coins, Part 2 is also available here.